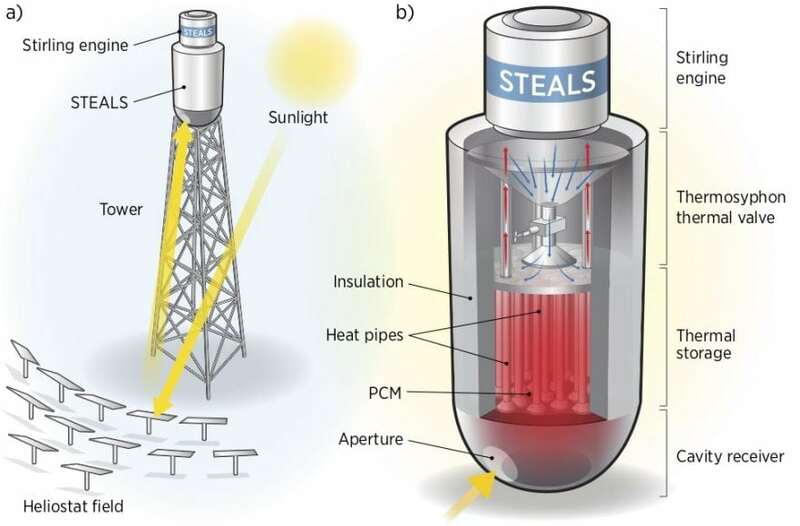 Figure 1 – (a) The Solar Thermal to Electricity via Advanced Latent heat Storage (STEALS) design integrates latent heat thermal energy storage, a valved thermosyphon, and a Stirling engine on top of a small scale solar power tower. (b) Heliostats reflect sunlight through a cavity receiver to the bottom of a thermal storage tank that is filled with a phase change material (PCM). Sodium heat pipes are embedded in the PCM, and extend vertically from the receiver to the top of the storage tank to passively distribute heat through the storage system. The top of the heat pipes interface with the evaporator of a valved thermosyphon. At this surface, liquid sodium evaporates, travels up through vapor tubes (red arrows), and condense son the heater head of the Stirling engine. Liquid sodium then returns to the evaporator through a return funnel (blue arrows). To regulate electricity output, opening or closing a valve in the liquid return tube throttles the flow of sodium and controls the heat flow from the storage to the power block. Solar photovoltaics (PV) has been growing at an exponential rate, more than doubling in the past 3 years to reach over 300 GW of power generation capacity . This has been driven by cost reduction, making rooftop solar more attractive to homeowners, and making utility-scale installations competitive against conventional fossil-fuel power plants. On the other hand, concentrating solar power (CSP) has experienced less growth. Globally, just 1.5 GW of new CSP capacity became operational from 2015-2017. The United States hasn’t installed any new CSP capacity at all since September 2015 . Conventional CSP designs use large plant sizes, with large amounts of thermal energy storage, to leverage economies of scale and increase capacity factor. This makes sense as a strategy to minimize the cost of generating electricity on a per-kWh basis, but it doesn’t consider the value of the electricity provided by the plant, or the resulting profitability of the plant. Further, large plant sizes require huge capital investments (>$1B). This limits conventional CSP to only utility-scale markets increases financial risk and doesn’t allow CSP to progress by learning through iteration (like PV has done). 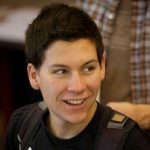 So if CSP is falling behind now, what can be done with CSP in the future? The primary benefit of CSP is that with low-cost thermal energy storage, it can provide high-value electricity, and out-compete batteries for renewable generation when the sun isn’t shining (thermal energy storage cost is near 20 $/kWh, while batteries are unlikely to drop below 150 $/kWh [3-5]). This is certainly important for utilities that are concerned with grid reliability as PV grows (have you heard of the “Duck Curve”? ), but could also provide a more reliable source of electricity for micro-grids or other applications with smaller electricity demands. 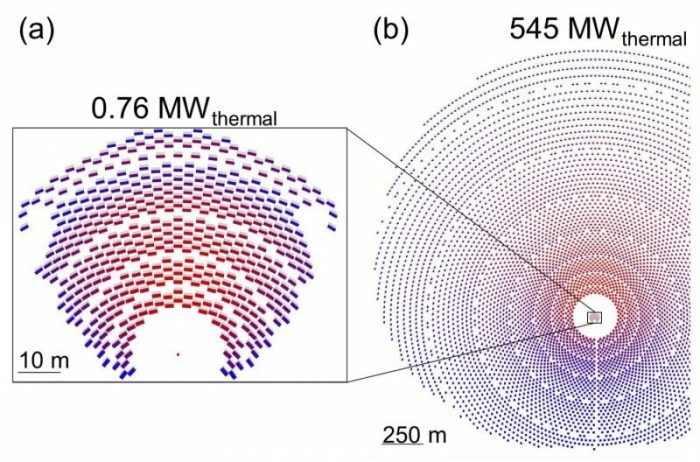 New work from the National Renewable Energy Laboratory (NREL) and the Colorado School of Mines (CSM) proposes a new kind of approach that radically differs from conventional CSP designs. Their idea is to shrink down the typical CSP plant size by 1000 times – from 100 MWe to 100 kWe – and use cheap materials and passive heat transfer mechanisms to reduce cost. At this small scale, they have designed a solar power tower with the entire system, including thermal energy storage and a power block, held on top of the tower. Figure 2 – (a) STEALS diverges from (b) conventional CSP designs by shrinking down the size of the system (from 100 MWelectric to 100 kWelectric, or 545 to 0.76 MWthermal). This improves design point optical efficiency from 66 to 84%. This image has been reprinted with permission from Elsevier. This system, termed “STEALS,” stores thermal energy via the latent heat of recycled aluminum, which can cost less than 2 $/kg (~12 $/kWh). It also uses a novel method of heat flow control, a valved thermosyphon, which can turn on and off heat transfer by simply opening or closing a valve to modify the flow of the heat transfer fluid. To complete the system, STEALS uses a Stirling engine to convert heat to electricity, at a relatively high efficiency considering its small scale. In their new paper, the NREL-CSM team predicts that STEALS would have an annual efficiency of 24%. This includes a higher than usual heliostat field optical efficiency because of its small size (71% on an annual basis), but a lower power block conversion efficiency (30%) because a small scale Stirling engine is lower efficiency than large Rankine cycles. Cost analysis presented in this paper also shows that STEALS has the potential to compete with both renewable (PV with batteries) and non-renewable (natural gas combustion turbine plants) alternatives for peaking power generation. The electricity cost from STEALS is nearly independent of size, which means that it could easily be designed for specific applications with varying power demands. With the addition of STEALS into the generation mix, the technology could help enable deeper penetration of renewable electricity from wind and PV and could accelerate progress in the pursuit of a 100% renewable electricity grid. Figure 3 – STEALS has the potential to be cost-competitive with both renewable technologies and natural gas peaking plants at a capacity factor of 30%. 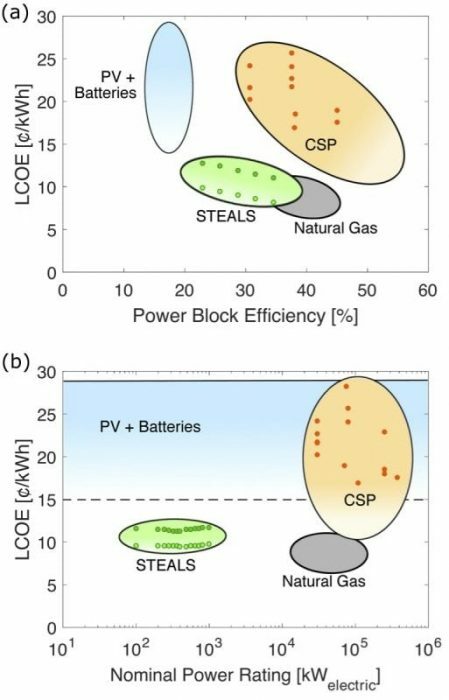 (a) The levelized cost of electricity (LCOE) of STEALS falls with increasing power block efficiency and depends significantly on power block cost. (b) The LCOE of STEALS is nearly independent of system size. This is due to the modularity of Stirling engines as the power block and the scalability of the entire system design. This image has been reprinted with permission from Elsevier. These findings are described in the article entitled Modular concentrated solar power with latent heat storage, recently published in the journal Applied Energy. This work was conducted by Jonathan Rea, Christopher Oshman, Corey Hardin, and Eric Toberer from the Colorado School of Mines, along with Michele Olsen, Greg Glatzmaier, Philip Parilla, and David Ginley from the National Renewable Energy Laboratory, and Nathan Siegel from Bucknell University. IRENA. Renewable capacity statistics 2017. International Renewable Energy Agency (IRENA), 2017. Lilliestam J, Labordena M, Patt, A, Pfenninger S. Empirically observed learning rates for concentrating solar power and their responses to regime change. Nature Energy 2017;2:17094. Mehos M, Turchi C, Jorgenson J, Denholm P, Ho C, Armijo K. On the Path to SunShot: Advancing Concentrating Solar Power Technology, Performance, and Dispatchability. NREL/TP-5500-65688, 2016. Schmidt O, Hawkes A, Gambhir A, Staffell I. The future cost of electrical energy storage based on experience rates. Nature Energy 2017;2:17110. https://www.nature.com/articles/nenergy2017110?error=cookies_not_supported&code=6fcbffbf-7566-4f41-9148-8b1fb987f538. Wood III DL, Li J, Daniel C. Prospects for reducing the processing cost of lithium ion batteries. Journal of Power Sources 2015;275:234-242. https://linkinghub.elsevier.com/retrieve/pii/S037877531401845X. Denholm P, O’Connell M, Brinkman G, Jorgenson J. Overgeneration from Solar Energy in California: A Field Guide to the Duck Chart. NREL/TP-6A20-65023, 2015. Jonathan holds a B.S. in Mechanical Engineering from MIT '14, Ph.D. in Materials Science from the Colorado School of Mines '19. He has extensive research experience with strong skills in Idea Development, System Design, System Modeling, Thermodynamic Analysis, Heat Transfer Analysis, Techno-Economic Analysis, Data Analysis, Technical Writing, and Oral Presentation.